i always get a lot of questions about my skin and my makeup. sometimes from people who i've known for a long time, but mostly from people who i don't know at all like waitresses at restaurants and cashiers at grocery stores. i'm grateful to have skin that is pretty well behaved and doesn't break out often (in large part to my diet and my skin care regimen) but i do have incredibly thin skin (especially under my eyes) which is one of the reasons i wear makeup everyday. i also have very sensitive skin, so products really have to pass the test to earn a permanent place at my house. in the past, i've shared my top 5 must-have skin care products by the season (summer and winter). 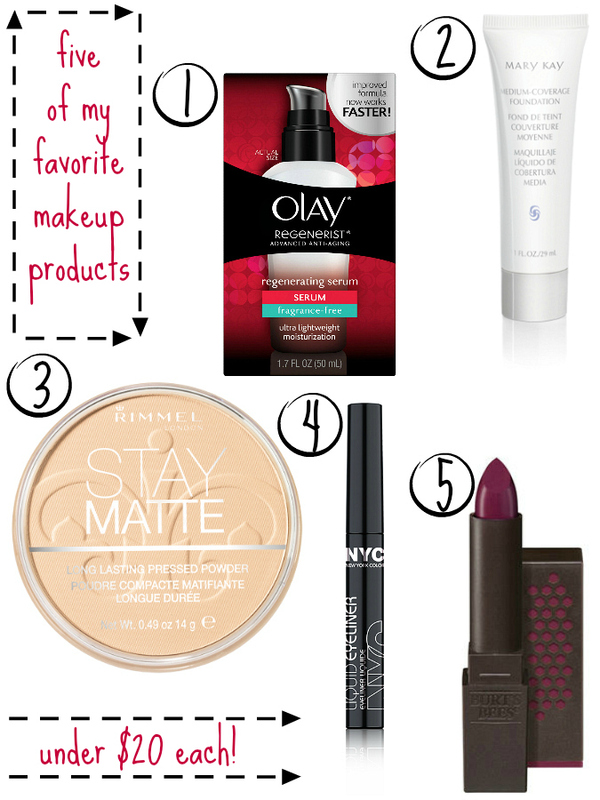 so, today i wanted to share 5 of my favorite makeup products that i use on a daily basis. let me preface this by saying that this post is not sponsored by any of these brands. these are products that i have used for a long time and swear by because of my own positive experience with them. everyone's skin is completely different, but for me here are 5 makeup products that i love . . .
i'm super picky when it comes to foundation. i've tried tons with no luck and i'm often surprised at how many actually burn my skin (hello, sensitive skin). my mom and i have worn mary kay products for years, and we both love this liquid foundation. it lasts all day long, even through sweating at dance and the gym. it's also fragrance free and oil free too, and i love the way it dries. the "cat eye" is my signature look. i've tried different types of liquid eye liners, but my favorite which i go back to again and again is this nyc version in black. i love it because it has one of the best applicator wands ever. (the key to a good cat eye is two things: a steady hand and a great wand.) it's sold just about everywhere and it's so inexpensive. you can't beat it! i don't wear lipstick on a regular basis. most days, i just wear burts bees lip balm which is colorless. however, on occasions when i have to wear lipstick, i reach for this burts bees lipstick. my favorite color is brimming berry. as someone who has spent a lot of time on stage wearing lipstick, i hate how most lipsticks leave your lips super dry. this is the most moisturizing lipstick i have ever used and as a bonus it smells really nice too. these certainly are not the only makeup products that i use. i have an arsenal of products that go into making me look human everyday, but these are some of my favorites. what are some of your favorites? Anything to make us beautiful. Nothing seems to work lately.